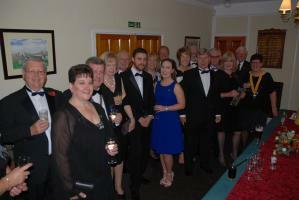 Members and Guests celebrated at Blackpool South Rotary Club's 66th Charter Dinner. 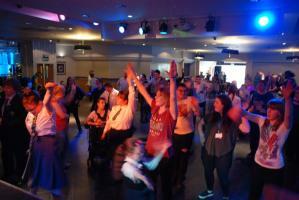 A great evening to raise funds for Highfield Students to participate in Rotary Sponsored Projects. 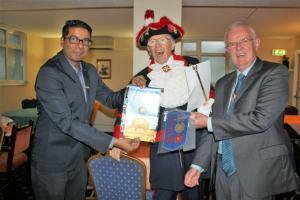 Eric Hind took over as President of the Rotary Club of Blackpool South. Eric will serve for 12 months. 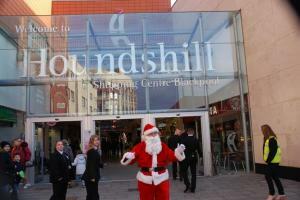 Blackpool South Rotary members assisted by friends were fund-raising in Blackpool's Main Shopping Centre. 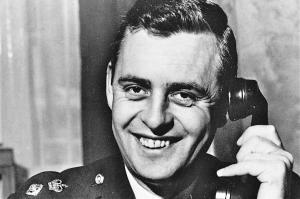 On the 23rd August 2016, a 45th Anniversary Celebration Commemorative Dinner was held at the Imperial Hotel, North Promenade, Blackpool to commemorate this outstanding Police Officer and Rotarian and to celebrate his legacy. 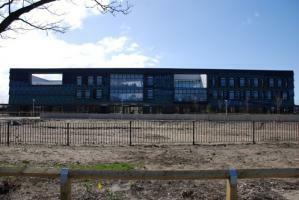 Highfield Humanities College students produced some outstanding pieces of artwork. 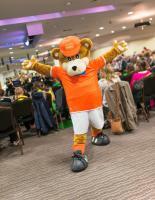 The 23rd Annual Festival saw over 100 children performing. 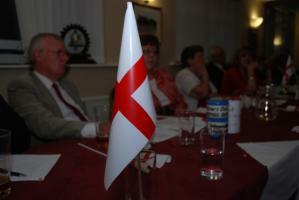 Members and Guests gathered to celebrate the English Patron Saint. 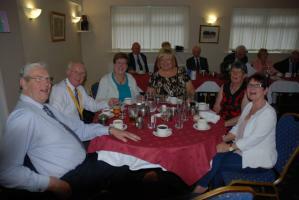 Barbara Charlton was inducted as President of Blackpool South Rotary Club on Monday 6th July 2015. On the 25th January 2016, members and guests gathered to celebrate the life of Robbie Burns. 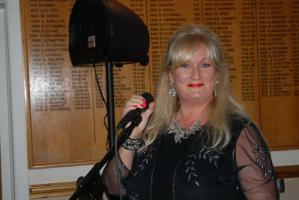 Members and Guests enjoyed a Burns Night Supper on Monday 26th January at Blackpool Park Golf Club. 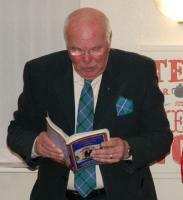 Piper Barry McQueen piped in the haggis which was addressed by Alf Clempson who also spoke about Robbie Burns. 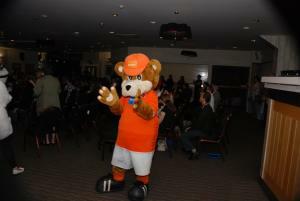 The Charter Dinner is the Club's Birthday party. 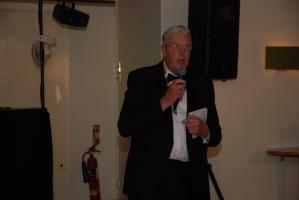 On the 1st July 2014, Ron Greenhough took over as President of Blackpool South Rotary Club. 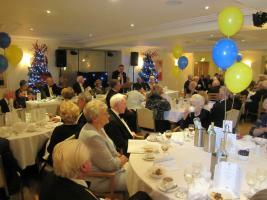 Members and guests attended the Club's 62nd Anniversary Charter Dinner at the Carousel Hotel, New South Promenade, Blackpool on the evening of Friday 14th November 2014. A most enjoyable night was had by all. 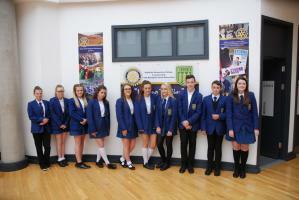 The annual Special Schools Music Festival took place in the Woodland Suite at Ribby Hall Village, Wrea Green, on Friday 8th May 2015. 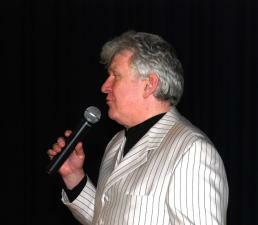 ON THE 6TH MAY 2015, THEATRICAL PRODUCER TONY JO PRODUCED A GREAT VARIETY SHOW AT HIGHFIELD HUMANITIES COLLEGE, BLACKPOOL TO RAISE FUNDS FOR HIGHFIELD STUDENTS TO PARTICIPATE IN ROTARY SPONSORED PROJECTS. Rotarian Dougie Tait believes that his great, great grandfather Captain John Tait, was the inspiration for J M Barrie's character Captain Hook. Dougie recently met characters from the Peter Pan Pantomime on at Blackpool's North Pier during Easter 2015. 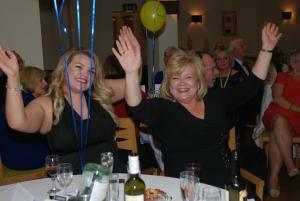 A Lancashire Night was held at St Kentigern’s Parish Centre, Blackpool on the evening of Friday 6th March 2015 to raise funds for The Superintendent Gerald Richardson Memorial Youth Trust, a Trust set up by the former Blackpool North Rotary Club. 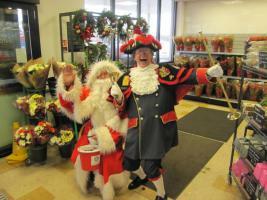 The dream team of Santa and Town Crier Barry McQueen paid a visit to Booths Superstore in Marton, Blackpool on Tuesday 23rd December 2014. 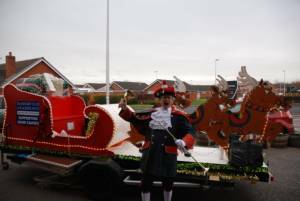 Santa's Musical Illuminated Sleigh added to the Festive atmosphere. 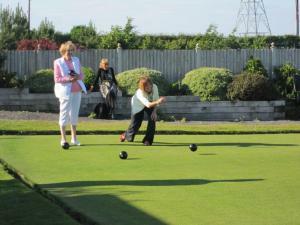 Members and guests competed in a Crown Green Bowling Competition at Staining Lodge Golf Club on Monday 23rd June. 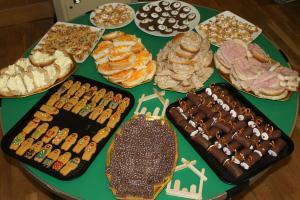 Members and guests enjoyed a French Themed St Valentine's Dinner at Staining Lodge Golf Club on the 17th February 2014. 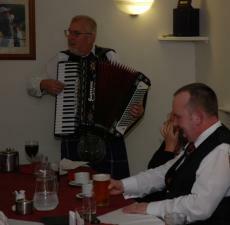 A Burns Type Night was held on the 27th January 2014 hosted by member Dougie Tait of The Clan Douglas. 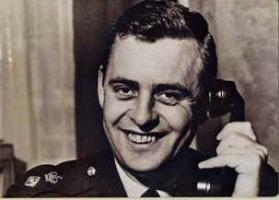 The Piper for the evening was Honorary Member Barry McQueen. 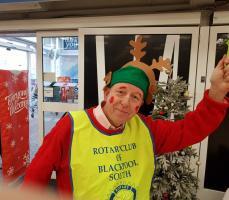 Blackpool South Rotary Club Musical Santa Sleigh paid a visit to the Booths Store in Marton for a charity collection. 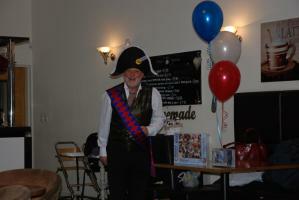 Town Crier and Club Honorary Member Barry McQueen also attended. 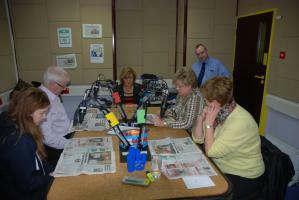 Blackpool South Rotary Club members are part of the local Talking Newspaper Volunteer Team. 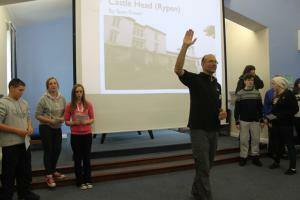 On Monday 10th December the team were joined by Katie Clempson 14 years, a student of Hodgson Academy in Poulton. Katie has an interest in Media Studies. 70 people gathered to celebrate Blackpool South's 61st Charter Dinner at the Carousel Hotel, Blackpool on Friday 15th November 2013. It was a night of friendship and laughter. Blackpool South Rotary Club and Highfield Humanities College joined together to organise a birthday charity bash to raise funds for the students to participate in Rotary's adventure and educational projects. One of the outstanding events organised by the Superintendent Gerald Richardson Memorial Youth Trust is the annual Special Schools Music Festival. 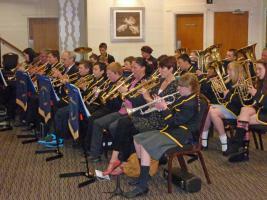 Photo shows Park School Band. 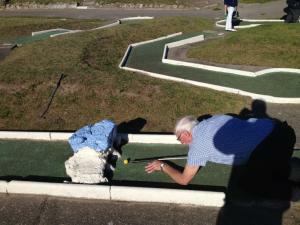 Our members are adaptable and like a challenge.